This is the sixth article in my on-going series called Things J.R.R. Tolkien has never said, done, written or had anything to do with (see here for for the other articles.) For those of you who haven’t heard of it – there is a desperate need to debunk rumours, assumptions and wrong quotes linked to J. R. R. Tolkien as they have been spreading throughout the web in recent years and people are mistakingly assuming the author and academic Tolkien to have said and done things there is no proof at all for. In this particular article I would like to reiterate my warning to take _any quotation_ at Goodreads for granted. The number of wrong quotes there is staggering and it is therefore completely useless as a source for any quote whatsoever. Yes, this quote has been attributed to Tolkien, not only on Goodreads. There is an area where SF has most often failed to judge itself, and where it has been most harshly judged by its nonpartisans. It is an area where we badly need intelligent criticism and discussion. The oldest argument against SF is both the shallowest and the profoundest: the assertion that SF, like all fantasy, is escapist. This statement is shallow when made by the shallow. When an insurance broker tells you that SF doesn’t deal with the Real World, when a chemistry freshman informs you that Science has disproved Myth, when a censor suppresses a book because it doesn’t fit the canons of Socialist Realism, and so forth, that’s not criticism; it’s bigotry. If it’s worth answering, the best answer is given by Tolkien, author, critic, and scholar. Yes, he said, fantasy is escapist, and that is its glory. If a soldier is imprisoned by the enemy, don’t we consider it his duty to escape? The moneylenders, the knownothings, the authoritarians have us all in prison; if we value the freedom of the mind and soul, if we’re partisans of liberty, then it’s our plain duty to escape, and to take as many people with us as we can. If you happen to meet one of those people who know better than you what “escapism” means and what dangers lie ahead of you if you fall for fantasy or SF get yourself a copy of The Monsters and the Critics and other Essays in which you will also find On Fairy-Stories, read it, and show them what you’ve got. I was literally just looking for this quote and came across this site. Thanks for the article, both interesting/informative and goddamn helpful. Also helps that this inspires me to improve my English skills to the maximum, I consider myself proficient enough in it, but would be nice to be even better. A little bit more information for you, Marcel, since I’ve researched this quotation too. The source of the misattribution, I believe, comes from an essay by Stephen R. Lawhead, first published in Reality and the Vision (ed. Philip Yancey, 1990). Lawhead is a popular fantasy author himself and not a scholar, so it is perhaps excusable that he offers no citation. What is much more regrettable is that he misunderstood Le Guin’s passage (she also offers no citation) to be a complete quotation from Tolkien. But Le Guin was merely paraphrasing, and she does not put the passage in quotation marks. Lawhead *does* put the entire passage in quotation marks! A few years later, Joseph Pearce reprinted Lawhead’s essay in his collection, Tolkien: A Celebration (1999), where the passage occurs on p. 167, still in quotation marks and without citation. So carelessness (possibly excusable) on the part of a popular author was perpetuated by someone who, in my view, should have known better and done more to verify it rather than merely reprinting it. I think it is probably from Pearce’s book that it spread like wildfire (I doubt as many people read Yancey’s book). 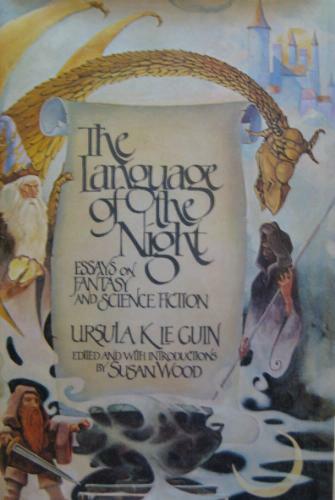 By the way, I asked Le Guin about this in person last fall when I saw her at the Puyallup Book Fair, and she confirmed for me that she was merely paraphrasing Tolkien in a talk (or series of talks) she delivered in the early 1970s, and the rest of it was her interpretation and expansion on Tolkien’s meaning. This came just a few years after Tree and Leaf had been published in the U.S., so Tolkien’s comments in “On Fairy-stories” were fresh in her mind. Aye, thank you, indeed, Jason! I’d add that Le Guin was not supposed to use quotation marks at all since she was paraphrasing, though one might have expected the absence of quotation marks to give it away to Lawhead. Also, I do wonder if Tolkien would have been entirely comfortable with the whole of Le Guin’s expansion of his meaning. I applaud Marcel’s efforts to promote accuracy about what Tolkien wrote and to debunk quotations widely misattributed to him. More than the works of almost any other author today, Tolkien’s writings are subject to the chances and whims of popular culture because of movies, games, music, and the internet. At best, the result is paraphrase; at worst it misrepresents his words, spreading lazy falsehoods in place of his superb intellect, craft and scholarship. Misquoting authors is a violation of these admirable principles. It demonstrates that Goodreads doesn’t care what the books actually say at all; and is not interested in knowledge or in empowering readers. Quite the reverse: it is content to spread misinformation, to the detriment of knowledge and to the disempowerment of readers. Readers use quotations because they value what is being said; many also value the way it is being said. So why should they be fed paraphrase in place of the proper original quotation? It is unfitting for a website promoting books and knowledge to publish reader-submitted quotations without checking their accuracy. It is wilful negligence to refuse to remove misquotations when presented with reliable evidence and expert testimony that they are in error.